The most common question someone asks me after they find out the work I do for a living is “what tools do you use”. This occurs regardless if the person only knows about digital forensics from TV shows or if they are a fellow practitioner. At meetings, conferences, or passing conversations the question is always one of the initial things someone asks. The question that has yet to be asked and in my opinion is the most important is “what process do you use”. The process is what determines the steps one takes to achieve an end goal; the tools only help complete those steps. Talking about tools outside the context of a process doesn’t provide an accurate picture. A carpenter can talk about his hammer all day long. It won’t mean much until he explains how he uses the hammer to accomplish something. In this post I’m unleashing auto_rip which is a wrapper script for RegRipper. Not only do I talk about what auto_rip is and how to use it but I also explain the process behind it as well. When I started this blog my main focus was to discuss the “process for investigating security incidents”. My first few posts were about the “initial examination steps I put together to investigate systems”. Ever since those early posts I’ve been honing and improving upon my process. I outlined my methodology on the jIIr methodology webpage and below are some of the steps listed for system examinations. Taking a closer look at the above examination steps it’s easier to see how artifacts can be organized beneath them. Take for example the step “Examine the programs ran on the system”. Beneath this step you can organize different artifacts such as: application compatibility cache, userassist, and muicache. The same concept applies to every step and artifact. The biggest benefit to approaching examinations in this manner is the increased efficiency and speed. You no longer find yourself jumping around looking at different items on a system. You remain focus on what you need to do and the data you need to examine to accomplish your end goal. When you start looking at all the artifacts within a category you get a more accurate picture and avoid overlooking artifacts when processing a case. The end result is your examinations are more focused, efficient, and timely. This is the concept behind why auto_rip was needed; this is the examination process auto_rip follows. There is one data source that provides a wealth of artifacts throughout the examination process. This data source is the Windows registry and it contains information for every single examination step I listed above. To parse the information from the registry my tool of choice has been RegRipper. However, I found myself doing one of two things. I was either running all the RegRipper plug-ins according to their registry hives then jumping around the reports depending on the step I was doing. The other method was running select plug-ins with rip (RegRipper command-line tool) based on the step I was performing. Both methods worked but they weren’t as fast as I wanted it to be when doing my examination process. Enter auto_rip. Extract all information from the SAM, Security, Software, and System hives. The auto_rip archive contains two files: auto_rip.pl and auto_rip.exe. Auto_rip.pl works with rip.pl while auto_rip.exe works with rip.exe. The script has been successfully tested on Windows and Linux. The auto_rip script needs to be placed in the same directory as rip.pl (or rip.exe). The output reports are placed in a sub-directory named auto_rip-reports as shown below. Automating RegRipper is not a new concept for me. I first discussed it almost two years ago in the post Obtaining Information about the Operating System. Auto_rip is just taking it to the next level and automating extracting information from the registry according to categories. I’ve been using auto_rip for some time now (initially it was a batch script). It has made my examinations faster; allowing me to produce results faster. How auto_rip is used depends on what you are trying to accomplish but here are a few ways I use it. One of my initial steps in any examination is to profile the system. To determine basic operating system information such as version, timezone, and installation dates, installed software information, local user accounts, networking configuration, and storage locations. It’s fairly easy to extract all this information with the command below. I tend to look what programs executed on the system and what programs are set to launch automatically when confronted with a system infected with malware. Again it’s fairly easy to do with auto_rip even when a user profile is included. Maybe I’m not interested in the programs that executed and only want to extract the Auto-Start Extensibility Points (ASEPs) from the registry hives. It’s breeze with auto_rip. 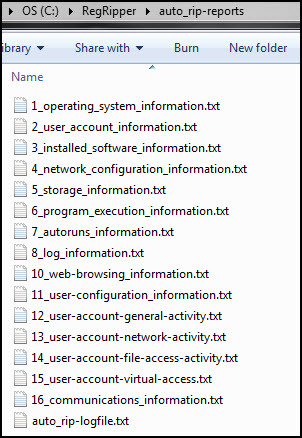 Another item I’m always interested in is what a user account has been doing on a system. What did they access on the network and what files and folders were opened. Extracting this information may be time consuming with other methods but not with auto_rip. To make things even easier and typically what I end up doing. Just run auto_rip with all the categories selected and review the output reports as needed. It only takes about a minute or two to finish. Auto_rip is an evolving tool. It started out as a batch script (that I didn’t release) and was moved over to Perl to it more versatile. Development is ongoing. My future plans are to extend its functionality and provide a GUI version to go along with the command-line version. Great post, Corey, and thanks for sharing this tool. Corey, this is excellent. I had done something similar with RR 2.5. I created a set of custom categories for the plugins for what I felt would assist me and speed up the examination. I then created custom profiles and dumped the plugin name into that profile. I would then select the custom profile from the drop box in the RR gui. I would like to suggest to Harlan and yourself that you take it a step further and consider an "Official Category" for each plugin and include that in the plugin description .csv file. I understand the dynamic nature of the artifacts and potential overlap (malware activity not necessarily user activity, vise versa), however the investigator can make that determination. For example, I have a category called "Malware Assist" when investigating an infected machine. The custom profile has all the plugins I consider will assist me in identifying notable activity quickly. I did my categories because as you mentioned, all the "jumping around" was time consuming and hard to keep track. Anyway, just my 2 cents. In closing...your work and Harlan's is incredible. I consider you both my virtual mentors and push myself everyday as I learn so much from both of you. I am looking forward to the book. I thinking creating wrapper scripts is one of the easiest ways speed up your examinations. The scripts make the tools do what you need them to do which saves time compared to jumping around. Harlan has already added category info to some plugins. Check out some of the TLN plugins for timelines. Good suggest though and its something to think about. Thanks for the comment and it's cool to hear someone else was thinking along the same lines. auto_rip has been a time saver and now I use it on all my cases. Thank you for releasing auto_rip (and all of the hard work you and Harlan have been putting into the RegRipper cleanup). With the number of RegRipper plugins growing, it makes logical sense to break them up by something other than originating hive. Excellent work matching plugins to process steps! where do you download this tool? Love this - thanks so much for taking the time to create it. This is great. Again, 2nd Chad's comments. Thanks for all the work on all the updates to RegRipper and new tools like auto_rip. I think I was on travel when this was released and am catching up on my blog reading now so Im late to the party. But hats off to you and Harlan for your continued work here. Thank you. "No such file or directory at script/auto_rip-exe.pl line 110". For those who get this error message, use double-quotes around your path name and everything will work fine. Thanks for making a great tool (RR) even better! advance for any assistance that you can provide! Invalid argument at script/auto_rip-exe.pl line 128. Invalid argument at script/auto_rip-exe.pl line 120. In your commands drop the ntuser.dat and usrclass.dat. Auto_rip works with folders and not file names. The below command is what you need. auto_rip -s "C:\regripwin7" -c os,users,software,network,storage,execution,autoruns,log,web,comm -n "C:\regripwin7" -c user_config,user_act,user_network,user_file,user_virtual -u "C:\regripwin7"
i don't have a textfile for the usrclass.dat. Is there a posability to choose the output path for the reports. In your command you only have to use the -c switch once. Also, if you don't use the -c switch then all plug-ins are released. The version I released after I made this post I added the -r switch to specify the output folder. Here is the link to the latest. i downloaded the most recent regripper 4-14, auto_rip64 with the .pl file. (your link) Put them in the regripper folder. CLI: regripper>auto_rip64 -s "D:\regripwin7" -c os,users...... -r D:\autoripreport. looking in the report only a header is present. no further data. nothing processed. What do i do wrong. I always look forward to your posts! Outstanding work.